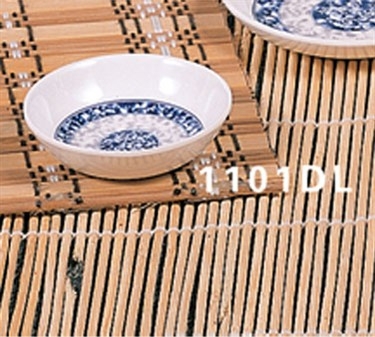 Serve your sauces, dips and condiments in the stylish Thunder Group 1101DL Blue Dragon Sauce Dish 2-3/4". This 1-ounce sauce dish has the look of fine ceramic, but it is made of durable, break-resistant melamine. Featuring a lovely blue and gray design on a prisitine white background, this NSF-approved dish is easy to handle, wash, stack and store.